Door to Door Service: Picking you up at your location and taking you to your destination. “Door to Door” means it’s a non-fixed route that requires advance scheduling by the rider. Also referred to as a shared-ride service, the daily routes vary and are generated by calls from our riders. 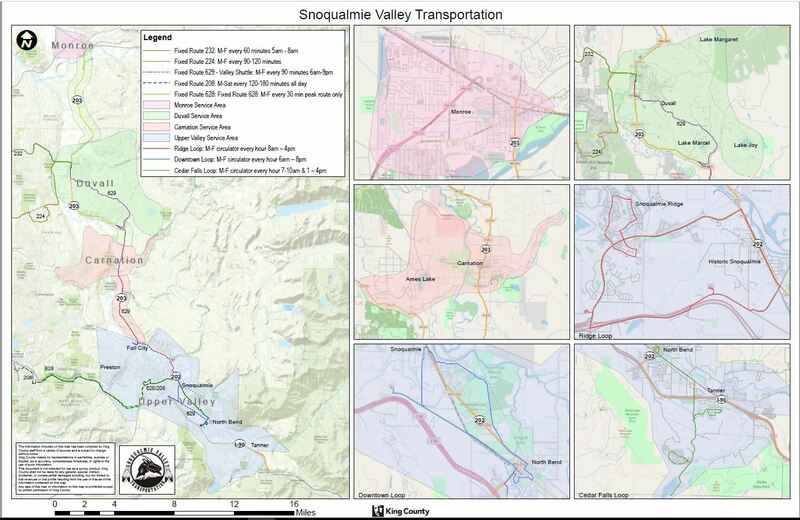 The service area for this includes Monroe, Duvall, Carnation, North Bend, Snoqualmie, Fall City and most of Preston (except Mitchell Hill). Click here for a larger map of our Door to Door service area. Typically, the vehicle will be dispatched to pick-up several riders at different pick-up points before taking them to their respective destinations and may be interrupted on the route to these destinations to pick up other riders. Call 3-5 days in advance whenever possible to book your ride. Our schedulers group customers together based on time and space availability with preference given to people with urgent medical needs, seniors and individuals with disabilities. Our goal is to meet our rider’s needs as closely as possible, while still being cost-effective. This service is available to the general public and there are no application or eligibility requirements. We will refer customers to use fixed route or Loop service first and foremost if it is available and accessible. All rides are $1 and the routes cover Monroe, Duvall, Carnation, North Bend, Snoqualmie, Fall City, and Preston with door-to-door service. For example, “I need a ride from my house next Thursday to my dentist in Snoqualmie”. The Door to Door Service operates between 6AM and 8PM, Monday through Friday. The buses say “SVT” in big letters on the top front. All buses are lift-equipped. This service is for seniors, riders with special needs, AND also for the general public. Anyone 13 years or older can take this bus. Under 13 must be accompanied by an adult. If you are a brand new rider, SVT collects some information about you. This is entered into our routing system so that rides can be easily booked in the future. Then SVT gathers the information on what types of rides are being requested. After all the information is gathered, SVT dispatchers figure out where riders want the buses to go on a specific day. People who have called in the earliest often get priority. SVT tries to get as many people on each bus as possible, so the rides may take longer than you expect; but all efforts are made to keep the rides as direct as the routes will allow. The more flexible people are, the more easily SVT can accommodate the most riders. There is a service window of 15 minutes before or after the time we schedule. Call us at 425-888-7001 to schedule a trip.